In fall 2009 I received a grant by the Manitoba Arts Council (Canada) for doing research on historical guitars. 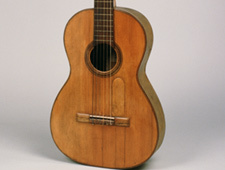 Although I had high hopes for measuring a guitar by a famous Spanish guitar maker of the nineteenth century, I was exhilarated when I learned that indeed I would be able to study a guitar by Antonio de Torres. The subject of my research was the FE 18 (as catalogued by José Romanillos) from 1864, which is currently in the possession of the collector and researcher James Westbrook. The objective of this project was to create technical drawings and an extensive description of the findings. The technical drawing was made digitally on a 1:1 scale, ready for instrument makers to use for further study and instrument making. Fortunately, during my apprenticeship we were trained in making technical drawings of instruments, which is an important part of the German and Austrian curriculum for future lutherie journeymen. And it comes in very handy when doing research such as this, of course.